What a lovely landscape. Thank you. The use of graphical methods to convey complex statistical information dramatically to a broad audience is not new. http://www.datavis.ca/gallery/historical.php This data viz collection cites splashes of brilliance. 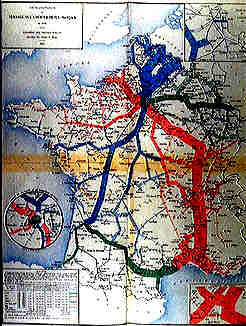 DataViz History: Charles Minard's Flow Map of Napoleon's Russian Campaign of 1812. A picture is worth a thousand words – or a thousand Excel data points, and Michael Sandberg at DataViz blog says he “preaches to everyone (or anyone who will listen)” that he aims to “get our business partners or clients excited about their data.” DataViz blog here examines and gushes over the famous Charles Minard graphic of Napoleon and the Russian Campaign of 1812. While hundreds of essays laud Minard’s graph scrutinizing its multi-layered, brilliant story-telling – of a multi-layered, brilliant, poignant story – right down to the color palette (which itself is meaningful), Sandberg’s article helpfully lists aspects to remember when we set out to build a good graphic. “What does the map show us?” A lot, is the answer: humanity writ large and very, frost-bitten, face-down in Bereniza, small. It’s data visualization fraught with the invisible from Minard’s personal politics to a “know your audience” marketing that recognizes, frankly, that people don’t like to have to go from page to page to make comparisons, so help them see the story. 1) Forces visual comparisons (the upper lighter band showing the large army going to Moscow vs. the narrow dark band showing the small army returning). 2) Shows causality (the temperature chart at the bottom). 3) Captures multivariate complexity (size of army, location, direction, temperature, and time). 4) Integrates text and graphic into a coherent whole. 5) Illustrate high quality content (complete and accurate data, presented to support Minard’s argument against war). 6) Place comparisons adjacent to each other, not sequentially (people forget if they have to go from page to page ). 7) Use the smallest effective differences (i.e., avoid bold colors, heavy lines, distracting labels and scales). In this 2010 piece African American Organic Farmers, Mark Winne, whose work examines food and social justice, writes from the dappled sunlight and live oaks of the Savannah’s Forsyth Farmers’ Market describing what appeared to him to be a renaissance of long-disenfranchised African-American farmers – there were “1 million African-American farmers in 1920, 29,000 in 2010” he writes, who have taken matters into their own hands. That culture, world-view, and experience nearly extinguished, is being fanned back to life by the ag. education and advocacy group and southern foodways non-profit, Southeastern African-American Farmers Organic Network, SAAFON, whose WordPress site, now five years on, linkless and neglected, may or may not be extant. What has become of these farmers? Are they using Georgia Cooperative Extension? Is main-stream ag education and a newly -inclusive organic farming community supporting them? The Southeastern African-American Farmers Organic Network (SAAFON) is a network of farmers using sustainable growing methods. The Network is comprised of small and limited resource farmers that are either certified organic or growing organically. 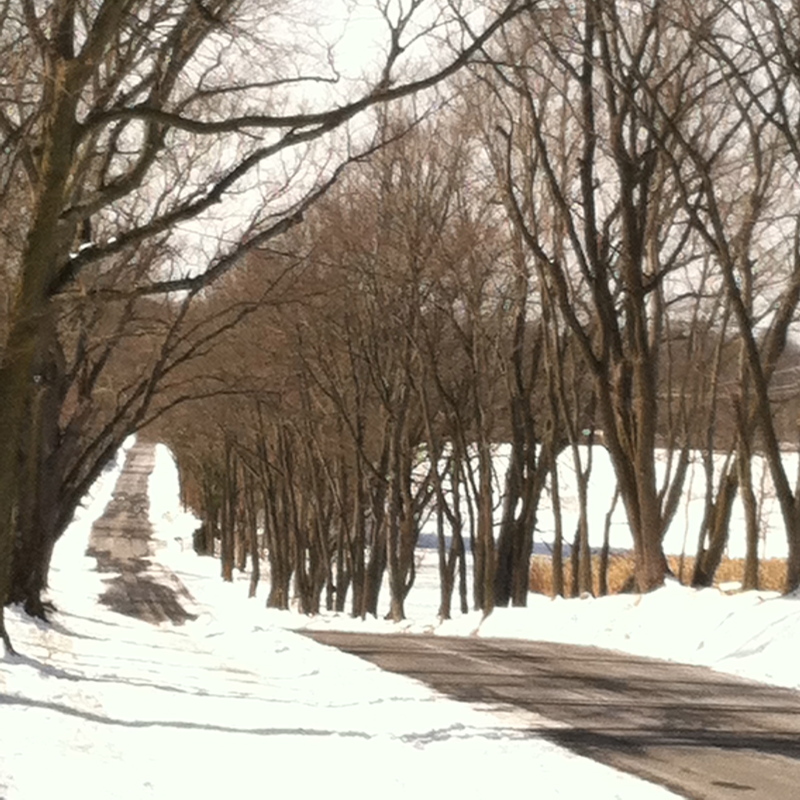 “The word ‘road’ in its old and roaming roots, originally meant ‘to travel by horse’ What a surprise…or is it? Not when you know what to look for. The Observer of Clarke County, March 2015. It was travelers on horseback navigating the landscape with a unique, lifted, horse-top perspective – seeing further than a person can on foot- who, centuries ago, crossed fields, forded rivers, and clambered up the grassy flanks of the Blue Ridge seeking easy passage to gaps and notches making their way to lands west. 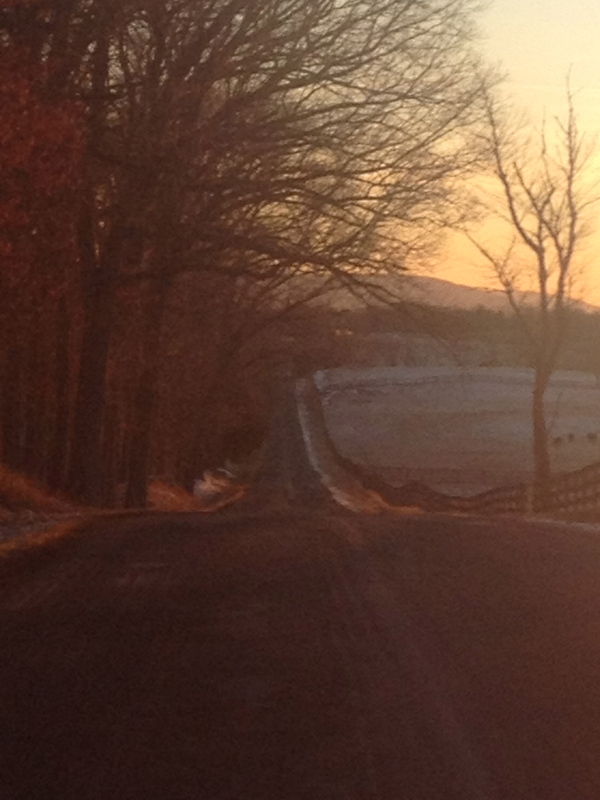 Horses and riders made the early roads and traces – about 100 by 1775 – that criss-cross what has become Clarke County. Those old roads, full of the stories that link People to Place, dwindling to bridle paths and odd berms in the woods, lost to most, have been kept from dissolving entirely by generations of horsebackers who, still roaming those woods and viewing the landscape from the saddle, may have saved old roads from vanishing entirely. Now, those roads and the stories they tell have been researched and mapped by historian equestrian, Matthew Mackay-Smith. Working with the Clarke County Historical Society, and Long Branch Plantation, his work, concentrating on King’s Road, Berry’s Ferry Road, and Commerce Road, is helping others learn how to see the roads that made us. On exhibit at Long Branch Plantation through spring then to the Clarke County Historical Society in Berryville, Virginia. 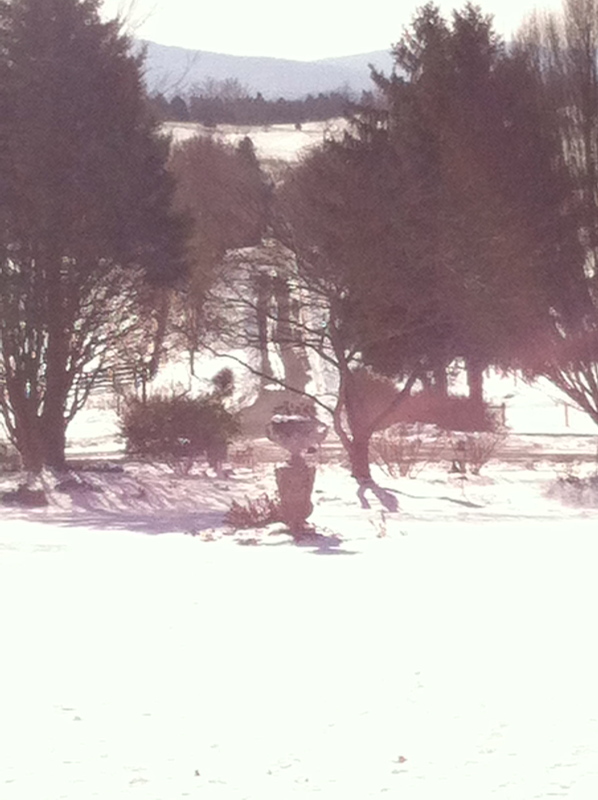 Following my GPS, I got lost on the way shooting off 340 later than advised. But stopping for historical markers I would have missed, I ended up trundling across train tracks, and Old Chapel Road, dropping down into Browntown sunken and cinder, its banks humped higher than the car following the remains of a stone wall, like a row of cairns now, flickering in the shaggy ceder treeline. 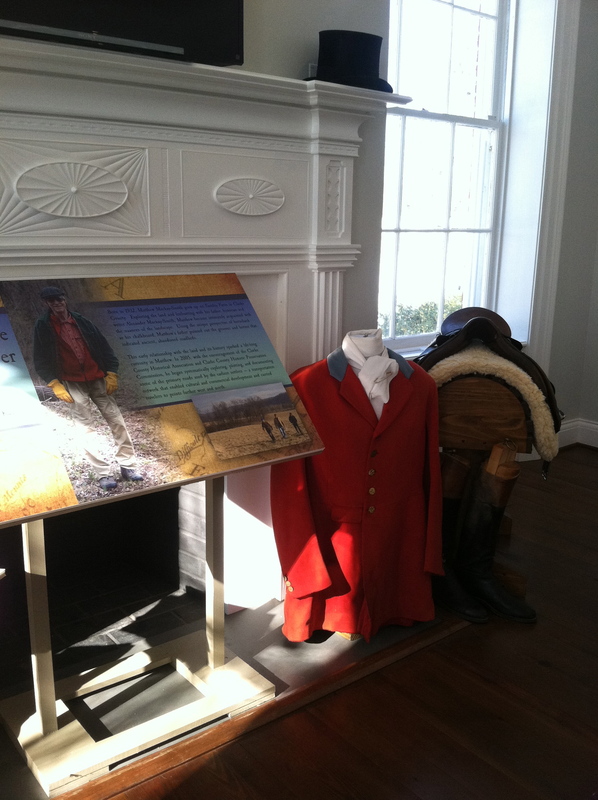 The Long Branch exhibit is called “Riding through History: Exploring Clarke’s Colonial Roads,” co-curated by historian and equestrian (considered the Father of Equine Sports Medicine) Matthew Mackay-Smith, the Clarke County Historical Association, and Long Branch Plantation. A scholarly, accessible collection describing Clarke County’s old (‘archaic’ says the exhibit) roads – carved first by European men on horseback who flowed across the fields and rivers, and up the forested flanks of the Blue Ridge seeking easy passage to lands west. Apt, the exhibit at Long Branch, a house that remembers those roads – owes its existence to them, in a small, elegant room full of windows and light, facing the hills. Its evocative writing (“at last scouts had found a gap in the seemingly impenetrable mountains…”) and multimedia: Snicker’s Gap Turnpike Lottery announcements, toll rates, (horse and rider 4 cents, a score of cattle or a phaeton, 12), and advice about ‘How to Spot an Old Road,’ made me gaze out the tall, old windows and their wobbly glass west to Blandy across the dazzling snow and empty fields. A widely accepted narrative intones the death of American small towns as young people flee to cities leaving behind peeling paint, empty fields, aluminum walkers, and meth. But now, the “brain drain” picture is being re-framed. University of Minnesota fellow, Ben Winchester, is taking a second look at census data revealing, not a “brain drain” but a “brain gain.” Mid-career and retirees are bringing new ideas, wealth, and lifestyles to rural America. The hedgerows of England, Wales, and Scotland – wildly diverse and some ancient (officially defined as having been in existence before the Enclosures Acts, which mostly passed between 1720 and 1840), says DEFRA, the UK’s Department of Environment, Food, and Rural Affairs, who should know. Ancient practices of hedge laying , the cutting, bending, and weaving branches to thicken them. Hedges are recently protected if they are older than 30 years old, more than 20 meters long, connect to other hedges, or enclose horses, donkeys, or mules. 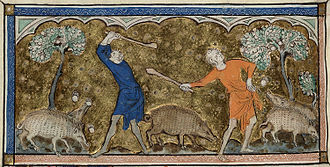 In the gold brocade and fine needlework of the 14th century Queen Mary’s psalter, peasants harvest acorns to feed swine. Pre-Columbian Maya traded feathers for cacao carrying small seedlings from South America possibly by canoe then cultivating them in a shrub layer in complex forest farms under the protective shade of leguminous nurse trees. Thousands of years before European settlers arrived in North America, native Americans selected fruit- and nut-producing plants for the characteristics they contributed to a larger, integrated system – trees, sometimes animals, soil, and people. Agroforestry – cultivating agricultural crops – both plant and animals – in intimate association with forests is an ancient practice, and it carries on today in novel scraps and pockets: the dehesa systems in Spain raise cork and holm oaks on shallow, rocky soils grazing cows, goats, and pigs, harvesting honey, mushrooms, cork and serving as last-vestige wildlife habitat for endangered eagles, vultures, and lynx. The Yoruba of western Nigeria cultivate, and have for generations, homegardens – hard-won from dense forest – pumpkins, yams, and beans, leaving some uncut trees whose leaf litter and roots will hold soil and contribute to its fertility. Fruit and nut orchards nurture mushrooms in Poland and the Black Forest, and the hedgerows of UK – many ancient, wildly diverse – are at once fencing, forage, shelter, and history – the meshing, in berries and birds, of people and landscape. Scraps and vestiges of hedgerows abound, this ancient practice that harvests limited quantities of many crops, gruelingly labor intensive, collapsed in developed countries as post-war mechanization required wide-open fields eliminated trees, irrigation removed the need for shade, policy shifts supporting monoculture commodity production that removed trees to maximize subsidized crops. People – who themselves, as harvesters, arrangers, protectors, groomers, and fertilizers of these multi-layered systems – moved away from countryside to cities. But 20 years later, in the mid-1970s, a reawakening of scientific interest in intercropping and multicropping farming systems coincided with a disturbing awareness of tropical deforestation and global ecological degradation, the energy crisis and accompanying ballooning fertilizer prices spread interest beyond academia and the World Bank began to reexamine priorities establishing cropping systems research centers. Not long after, forester John Bene of Canada’s International Development Research Centre coined the term ‘agroforestry’ and called for global recognition of the key role trees play on farms. Forty years on, repairing the agriculture and forestry dichotomy in temperate agricultural systems, may find its entre in forested riparian buffers. Maybe things are taking root. 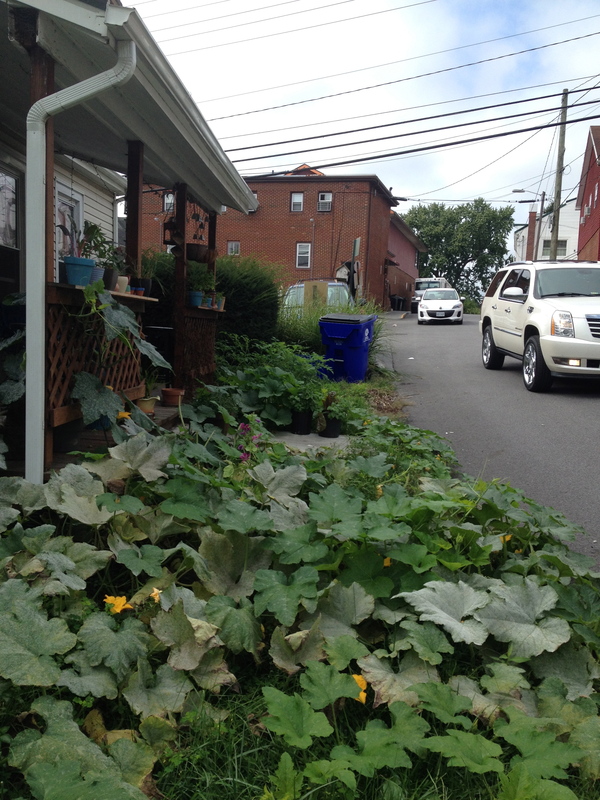 Bursting out of their flowerpots, North American suburban homegardens have gone beyond tomatoes on the patio. There are persimmons in the roses in Falls Church, hops growing up chimneys in Annandale, pumpkin-filled front yards on the corner. Can sububurban agriculture be more pioneering and political than its urban cousin? Land, shifting demographics, local food sensibilities and fewer or no zoning policy limitation make suburban gardens possible, the intrinsic creativity and culture-in-your-mouth aspects of koo gua in Vienna make them delicious. The “what’s old is new again” greenbelt idea of small-scale local food produced for cities make may make them powerful.